The Knowledgebase articles are deprecated. Please visit the new Guides and Resources here: https://www.uipath.com/developers/guides-and-resources. This sample automates an application via Citrix or Remote Desktop. Open the expenseit application on another computer. You should be connected via Remote Desktop. Click Image ["OK] and Click Image ["OK] to exit the edit mode. We add a string activity for parsing the result text (remove "Total Expenses ($)):" text. Create an automation workflow that allows you to type text into an application and clicks a button. This application is running in a virtual desktop. How to capture data from a Citrix machine in a spreadsheet format. The captured data later can be used to be passed on to another application. The automation will show you how to copy the contents by sending a click and keyboard commands to the Citrix App. How to get data from a Citrix apps in an image format by creating a workflow that would convert images into text. Instead of using an image, we can scrape text as our reference point. This technique makes our Citrix automation much more reliable and flexible. 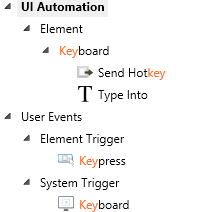 How to send mouse click events and keyboard input to applications running inside Citrix? How to Capture Mouse Event on Hover Menus? How to use the Try Catch Activity? How to pass value from another workflow? How to extract block of data from an application? How to extract Column Headers in a CSV file? How to install an Activity Pack from Workflow Activity Gallery? How to Pass Data From One Workflow to Another? How To Check if a File or a Folder Exists using Path Exists Activity? How To Check If An Element Or Window Exists? How to read data from a CSV file? How to Scrape the Whole Text Including Hidden Elements from a Terminal Window? How to capture Image in Citrix that needs to be scrolled down to appear visible? Does UiPath Studio Work with Published Citrix Applications? How to install UiPath Plugin in Firefox? How to Install MODI OCR? How can Silverlight object be accessed on XP? How do I fix "Trial Version Expired" error? Getting an Error During Registration "Failed With Error 34"